I’ve written before about how I’ve worked hard to develop a habit of reflection… daily, monthly, and annually. Although the end of the year is an arbitrary time, it is a convenient time to find a few days to be alone and look back on the prior months. This year I’m taking advantage of a couple days when my wife will be at a conference to sequester myself on a beach, disconnect, and ponder some questions. What had I planned on doing, what ended up happening, how can I improve on that, and what will I plan on doing this coming year? A few weeks before my annual ritual I also look for some inspiration that will help me look at the process of reflection – it is a process – from a new perspective. One year Jon Miller recommended Edgar Shein’s Humble Inquiry, which I found fascinating from many angles. 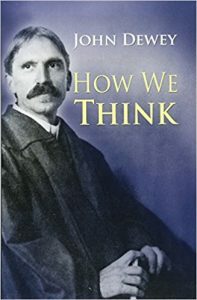 This year a friend told me about John Dewey, and specifically his book How We Think. It’s definitely not as easy of a read as Schein’s, but there are some jewels. Dewey dives deeply into thinking processes, and how our thoughts create beliefs that may be fallacious. So we need to look at how we think, and how that’s contributed to what we perceive, ie reflective thought. Thinking therefore becomes an intentional process of analyzing thoughts and beliefs. From which reflection is also a process. Intentional reflection, therefore, is not just sitting on the beach and letting a “medley” of thoughts on the past year flow through my head. It is a planned analysis. I’ll begin with the foundation of last year’s plan and the data of the results from that plan. I can then review what happened to each element of the plan and break that down to look at potential root causes for failures. It’s important to also look at root causes for successes, as those can be built upon and optimized. Then what are the commonalities between what happened with various elements of the plan? What experiments can I try to improve? What do I expect to happen? How and when will I know if I have succeeded or failed? How can I apply and integrate that into what I want to accomplish over the next year? How does that align with my personal principles, values, and my “why?” What do I want to stop doing? I’ve loosely followed that process in the past, but I want to be more disciplined this year. A couple of solid, disconnected days in solitude sound about right for this activity.